Demi Lovato (born Demetria Devonne Lovato; August 20, 1992 in Albuquerque, New Mexico, United States) is an American singer, songwriter, philanthropist, and actress. Within a few short years, Lovato went from a Disney starlet to a pop star with many hit singles to her credit, a judge position on the U.S. version of Simon Cowell's popular talent search show The X Factor, and a spokesperson for mental-health issues. She was raised in a household that included her mother (a former Dallas Cowboys Cheerleader) and her two sisters, the youngest of whom launched her own acting career in 2008. Demi started out as a child actress, starring as a cast regular on Barney and Friends before finding her way onto the Disney Channel with a brief role in As the Bell Rings. Lovato's debut album, Don't Forget, featuring songs co-written by the Jonas Brothers, was released by Hollywood Records several months after the premiere of Camp Rock, a 2008 Disney Channel movie starring Lovato and the Jonas siblings. Don't Forget debuted at number two, confirming Lovato's status as a star in her own right, and was followed in 2009 by the chart-topping Here We Go Again. Meanwhile, Lovato continued to act, appearing in a popular sequel to Camp Rock and starring in her own Disney series, Sonny with a Chance. In 2010, following a widely reported altercation with a backup dancer, Lovato left a tour with the Jonas Brothers to enter a treatment center for unspecified physical and emotional problems. After leaving the facility in 2011, Lovato announced that she had been treated for bulimia, among other issues, and had been diagnosed with bipolar disorder. She also revealed that she would not be returning to work on Sonny with a Chance. In 2011, Lovato released the studio album Unbroken, featuring the Toby Gad-produced single "Skyscraper." It became the biggest hit since her Camp Rock days, nesting at number ten on the Billboard Hot 100 and going platinum. The second single, "Give Your Heart a Break," peaked slightly lower at number 16, but was a bigger seller, eventually certifying at three-times platinum in the U.S. alone. Unbroken also featured co-starring roles for Timbaland and Missy Elliott on "All Night Long" and Jason Derulo on "Together." Lovato's comeback continued in 2012 when she, along with Britney Spears, signed on to be one of the four judges on the second season of the U.S. version of The X Factor. It debuted in the fall of 2012, and Lovato's role was a success, leading to her return for the 2013 season. Prior to the show's fall launch, Lovato released her fourth album, Demi, which appeared in May of 2013 -- preceded by the single "Heart Attack," which peaked in the Top Ten. A pair of subsequent singles reached the Top 40: "Neon Lights" and "Really Don't Care" (the latter featuring Cher Lloyd). She hit the Top 40 yet again with a contribution to yet another Disney vehicle, this time a cover version of Idina Menzel's "Let It Go" that was released as the lead single for the massive hit Frozen. Lovato also entered the best-selling books chart, with Staying Strong: 365 Days a Year, a collection of her thoughts and quotes from those who inspired her during her struggles with addiction and depression. During 2014, she had a recurring role on the TV show Glee and headlined two world tours. The following July, Lovato released "Cool for the Summer," the Max Martin and Wolf Cousins-produced lead single for her fifth studio album, Confident. The brassy title track was also issued as a single a few weeks before the album's October 2015 release. Other collaborators on the album included Iggy Azalea and songwriter Savan Kotecha, who also contributed to "Cool for the Summer." In addition to a Grammy nomination, Confident peaked at number two on the Billboard 200. In 2017, Lovato contributed vocals to Cheat Codes' "No Promises" and Jax Jones' "Instruction" before releasing her own single, "Sorry Not Sorry." 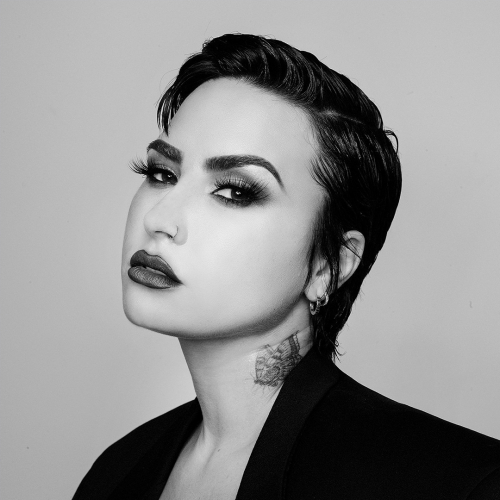 It was the first single from her sixth full-length album, Tell Me You Love Me, which appeared in September 2017.